Look at what arrived in the mail! Another round of samples from Sample Room. I chose two products: Cure Natural Aqua Gel and Gluta-C Intense Face and Body Whitening Soap. I'm so happy to get to try these out! Gluta-C soap and Cure for my 4th Sample Room haul. 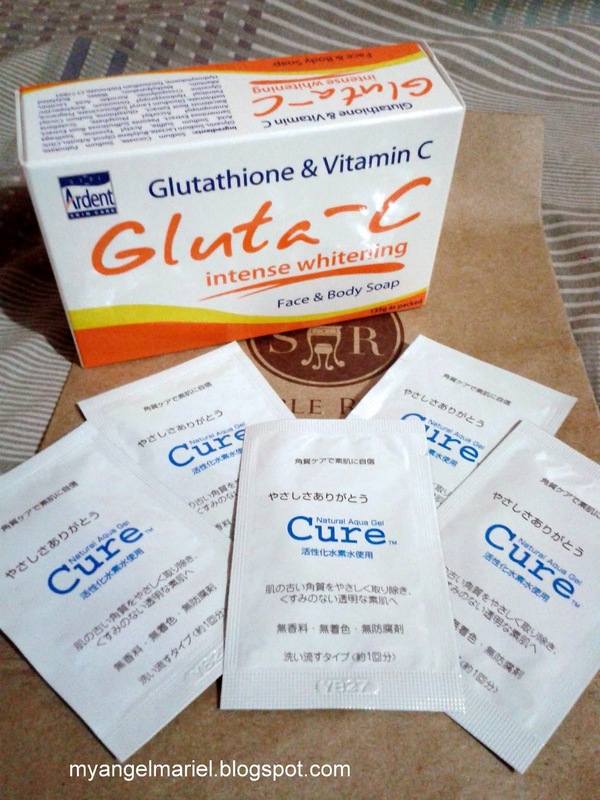 I decided to get the Gluta-C Intensive Whitening Soap because I ran out of SR points in my last haul... and I wanted to complete my Gluta-C line-up. With this, I plan to use it together with the scrub and lotion. Sample Room offered the full size of 135g for this sample. I first heard about Cure from popular cosplayer Kaika when she posted a video about skin care. She mentioned Cure as her exfoliator. So I got curious about it. I have heard raves about this product and the wonders it does to the skin! Now here is my turn to be amazed! Sample Room gave out five sachets of Cure. It is still all about skin care for this haul... and I love it! Now let me try them out right now... tah tah!